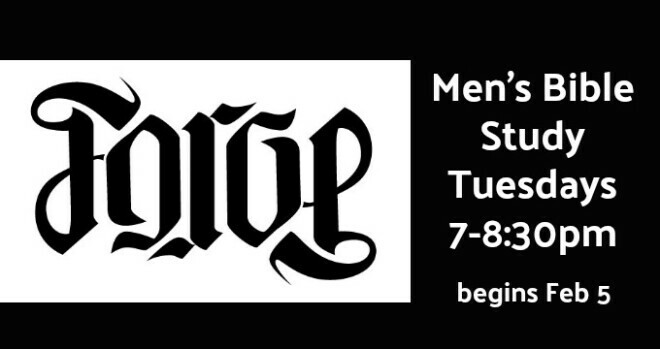 A new men's Bible Study group, "Forge" will be held on Tuesdays, 7-8:30pm in the Fellowship Room, beginning Tuesday, February 5. From creation, God has desired to have fellowship with mankind. The goal of this ministry is to help men recognize and fulfill this desire of God. To meet this objective, this ministry will provide opportunities for men to strengthen and grow in their Christian faith and to FORGE a bond of fellowship with other Christian men, as well as with God. Meetings will focus on God’s will through the study of scripture and group studies designed to relate to being a Christian man in today’s ever more secular world. The meetings will be relaxed and informal and aim to provide substance to all men, no matter the stage of their faith. Please Note: This is meant to supplement the Thursday morning and Saturday morning groups and to offer an alternative to men that may not find the other groups convenient.